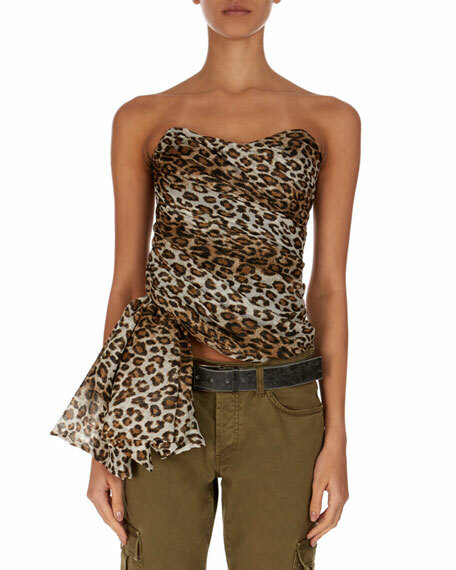 Redemption asymmetric blouse with leopard print. Co tunic blouse with floral-embroidery. Crew neckline; 1/2 button front. Cap sleeves. Self-tie belt. Swing silhouette. Yoked back; box pleat. Co tunic blouse with floral-embroidery. Crew neckline; 1/2 button front. Cap sleeves. Self-tie belt. Swing silhouette. Yoked back; box pleat. Slipover style. Polyester. Imported. Model's measurements: Height 5'11"/180cm, bust 33"/84cm, waist 24.5"/62cm, hips 34"/86cm, dress size US 2. Charmeuse. Approx. measurements: 30"L center back to hem, 26"L center front to hem. Spread collar; button front. Long sleeves; barrel cuffs. Front flap pockets. Loose silhouette; shirttail hem hits at thigh. Silk; dry clean. Imported. Kobi Halperin "Meghan" blouse features tucked detail at the neck and shoulders. High, round neckline. Short sleeves. Slim, princess-seamed fit. 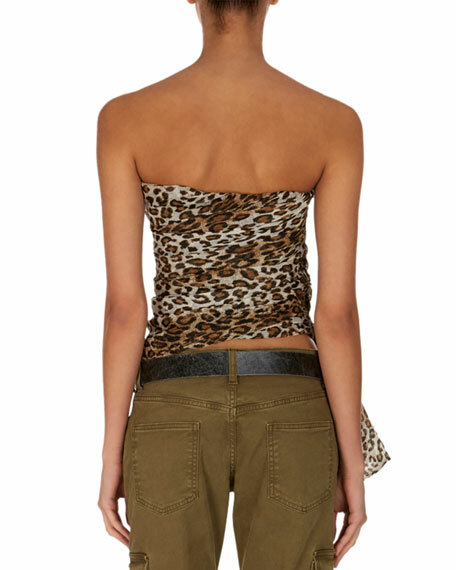 Kobi Halperin "Meghan" blouse features tucked detail at the neck and shoulders. High, round neckline. Short sleeves. Slim, princess-seamed fit. Hidden back zip. Polyester/rayon/spandex. Polyester lining. Dry clean. Imported. Model's measurements: Height 5'10"/177cm, bust 33"/84cm, waist 25.6"/65.2cm, hips 35.8"/91cm, dress size US 2-4/FR 34-36. La Prestic Ouiston "Janine" top with mixed-print panels. Bateau neckline. Long sleeves. Loose fit. Asymmetrical hem. Pullover styling. Silk twill. La Prestic Ouiston "Janine" top with mixed-print panels. Bateau neckline. Long sleeves. Loose fit. Asymmetrical hem. Pullover styling. Silk twill. Dry clean. Made in Bulgaria. Model's measurements: Height 5'10"/177cm, bust 33"/84cm, waist 25.6"/65.2cm, hips 35.8"/91cm, dress size US 2-4/FR 34-36.